This beautiful vessel holds orange blossom water for guests to refresh and cleanse. A vintage photograph of the couple is tucked behind the silver collection. 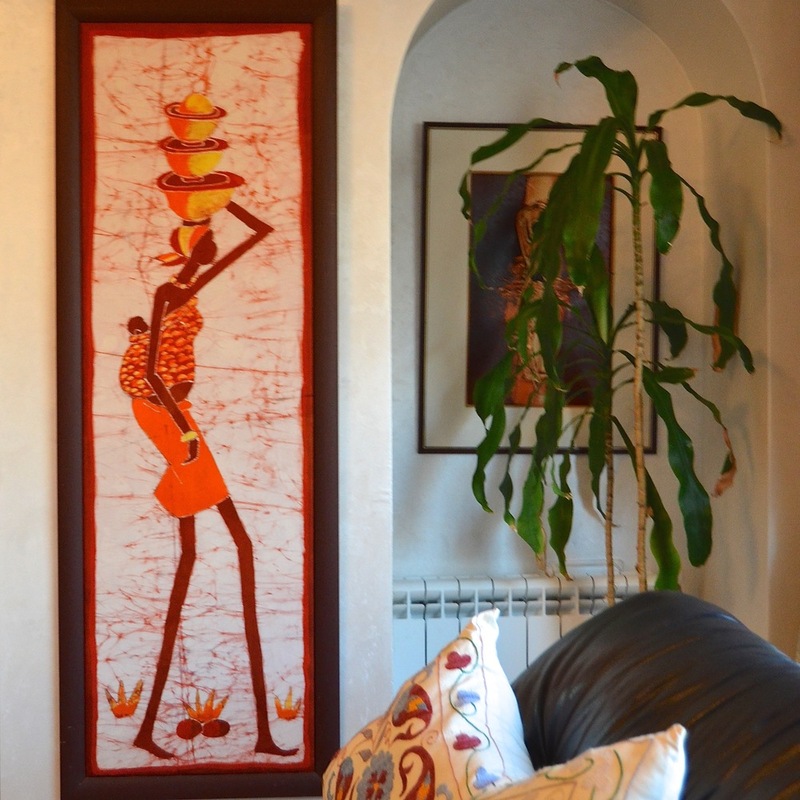 Local and international art lends eclectic elegance to unify the entire home. 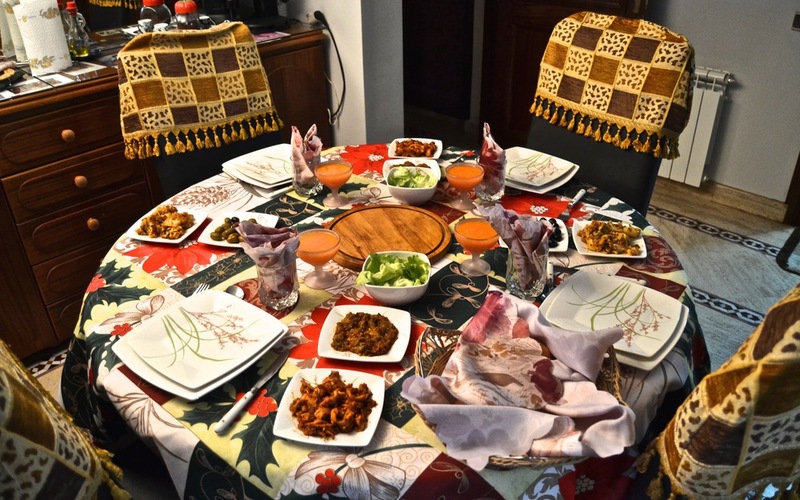 "We must have rooms large enough to accommodate our big Moroccan families," Thouria laughs. 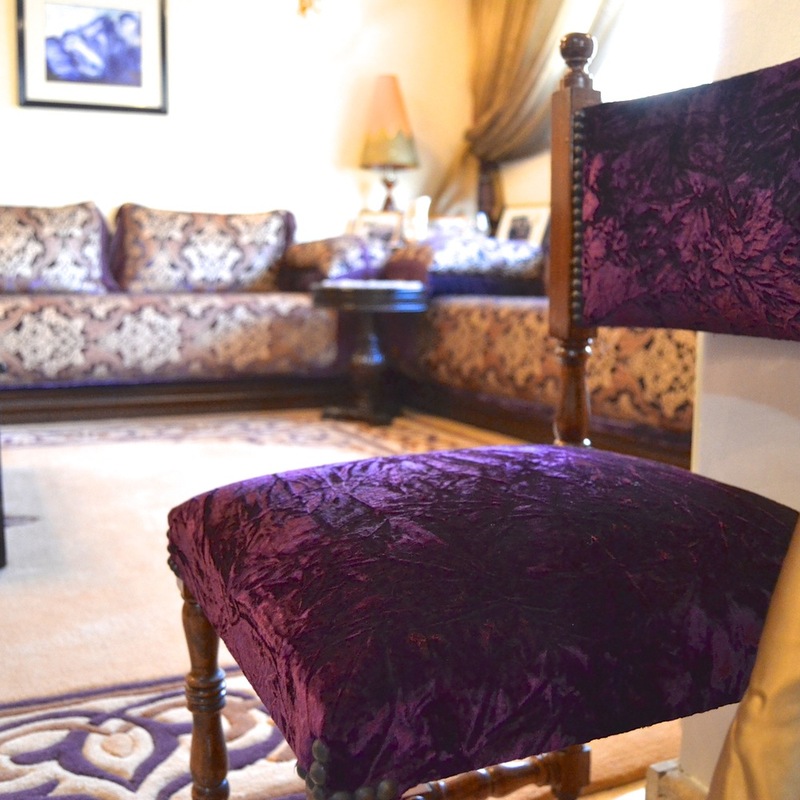 Small chairs can be pulled up for more guests to join festivities. Several seating areas welcome guests to relax and converse. Across from the formal living room is casual seating leading to the patio. This vibrant piece was painted by a colleague and incorporates found pieces from the hospital where Omar worked. Omar's garden is an oasis in Rabat's warm summers. The main door opens into the large, airy space with several seating areas. When one turns left, the cozy day-to-day spaces beckon. 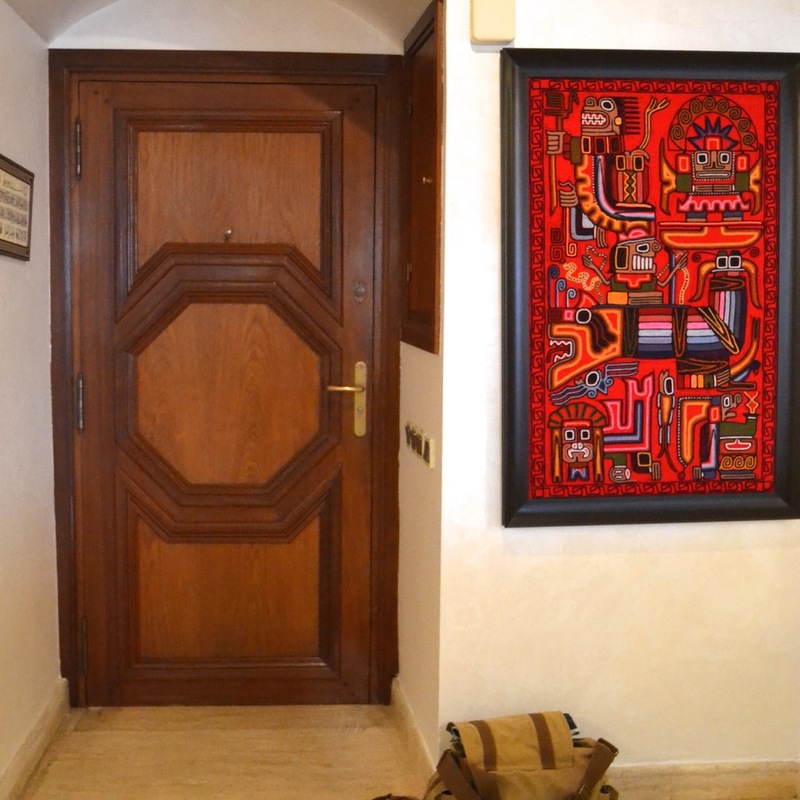 A hand of Fatima hangs on the doorway leading to the private quarters. The symbol brings blessings and protection. A laid-back version of the traditional living room is a favorite space in the home. Across from the casual living room is the sunny, spice-filled kitchen. Between the living room and the kitchen, a cozy table promises satisfying meals. Omar's study is filled with personal mementoes. Thouria's dressing room is anchored by a traditional woven rug. The bright and airy bedroom leads onto a petite patio overlooking the neighborhood. 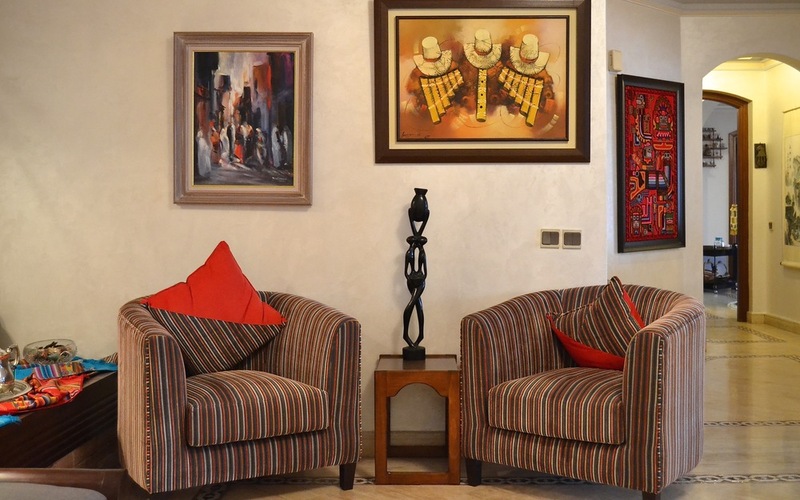 As treasured as the art collection, family photos line the hallways. Touria and Omar live in a bright, sun-filled apartment in Morocco's capital of Rabat. 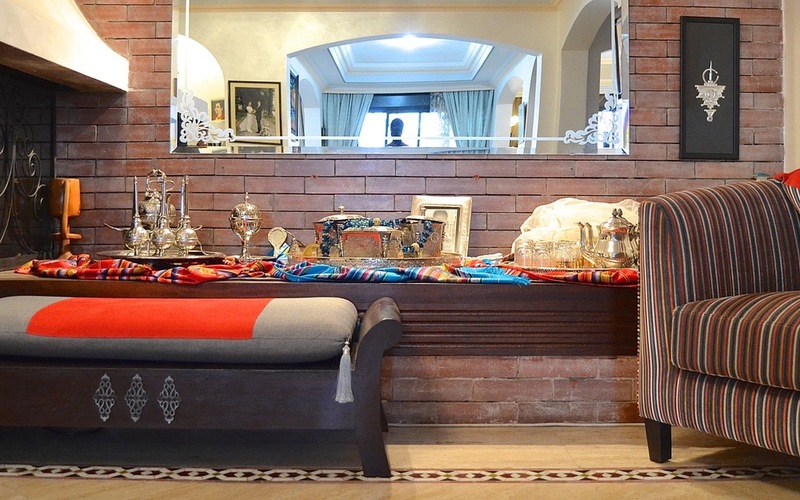 Their home is truly an extension of the couple and exudes vibrancy and warmth, as well as love of family and heritage. An open floor plan at the front of the apartment holds several seating areas to welcome guests throughout the year. A luxurious traditional living room anchors the space, complemented by modern touches for an eclectic and refined aesthetic. In the private quarters, sun spills in and infuses each room with light. 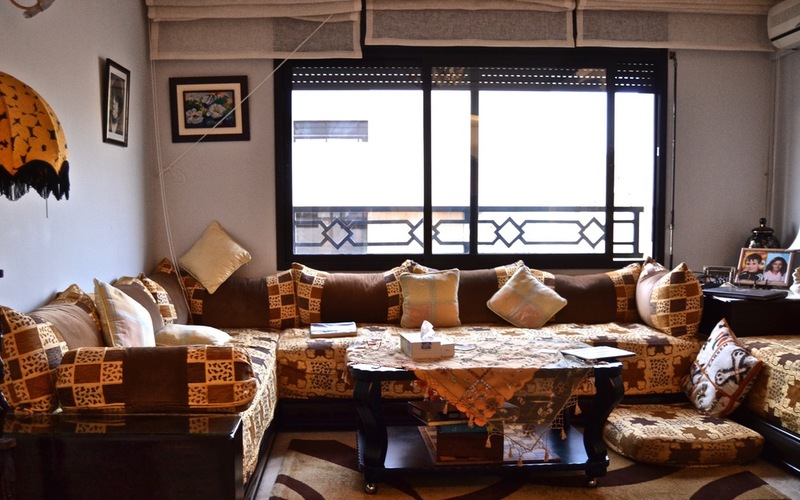 This cozy section of the house is where the couple spends most of their time, whether playing a daily game of Scrabble or enjoying Touria's delicious cooking.